Nvidia DSR, understanding why 4x 0% smoothness is WOW while 2x is terrible. Discussion in 'nVidia Flavor' started by sblantipodi, Jul 3, 2016. I'm running a 1920x1200 minitor 24 inch monitor. I tried every DSR settings with many games and I ended up that DSR 4x using 0% smoothness is the best DSR setting I can use in terms of quality. Using 0% smoothness I see no blurred texture/graphics and pratically no aliasing since 4K on a 24inch display is a huge resolution. Textures quality improves by a wow margin. Everything under DSR 4x produces worse quality than native resolution or no visibile improvement. Using DSR 2x for example produces an extremely choppy/aliased text. Can you explain me it please? Someone talked about integer scaling, but 2x DSR is integer scaling too, am I wrong? You have to remember that the scaling factor is referring to the final resolution, so 2880x1800 may be twice as many overall pixels as 1080, but that means that the scale factor per side (horizontal & vertical) is only 1.5 (1920 x 1.5 = 2880, 1200 x 1.5 = 1800). Maybe it is the native resolution of 1920x1200. 4k and whatnot are based off of 1920x1080. you got the exactly answer before, due to pixel scaling.. you should know that when you are using a non CRT monitor anything outside of the native resolution is going to be blurry and washed out right? the same happen with DSR until you reach the 4x factor, because you are exactly sampling 4x the same pixel in the same spot of the screen, each pixel is sampled 4 times with a perfect wide and height match.. anything below that number make the image being processed with unmatched screen length and wide area making it to be blurry. in a native resolution each pixel for game correspond for each pixel on the panel, making a 1:1 perfect ratio, so each screen pixel will receive it own game pixel vertical and horizontally. This may help to understand. DAOWAce, AlphaQup, tungt88 and 3 others like this. To add to this: As you've noticed you generally get the best image quality using 4x and 0% smoothness. However, that smoothness setting is designed to offset scaling issues. Use smoothness 33% (adjust to your preference) for non-4x factors. 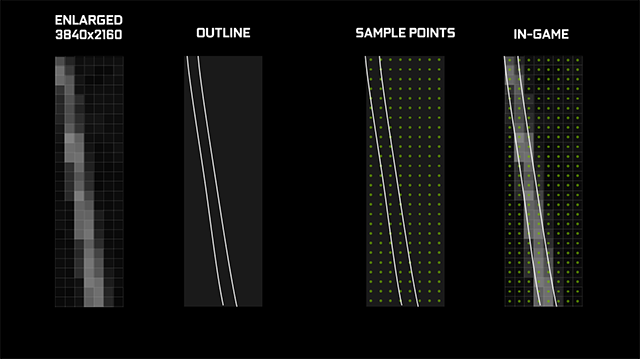 Doing this give then APPEARANCE of super-sampling AA + post-processing AA. Also, keep in mind that DSR used to correspond to your monitor's resolution (IE, 1920x1200 = 3840x2400), but now acts as a base of 1920x1080 (so 3840x2160), so you're still not getting a perfect 4x for your display. DSR resolution is based on Native monitor resolution, so he always going to receive perfect 4:1 scaling per pixel.. what's worth to mention and I forgot before, that the 4x Factor is related to pixel output as was hinted in the second post of this thread, 4x DSR factor it's quadrupling the native monitor resolution output so let's image it's 1920x1080 that mean 2.073.600 pixels. 4x DSR scale it up to 8.294.400 which its exactly four times the amount of pixels from 1920x1080 but the resolution in fact it's just double 1920*2 = 3840 1080*2= 2160.. with 2x DSR factor, total throughput should scale to 4.147.200 however when you see the end resolution is 2715*1527 which just mean 4.145.805 is not a perfect resolution scaling and is not a perfect 16:9 ratio so that mean missing pixels which's just make things blurry or the appearance of something wrong. 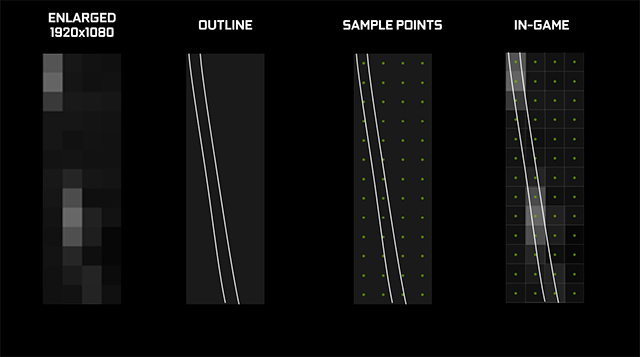 Will 2x sampling with 33% smoothing still look better than native-res AA methods? The dynamic it's because it have several scaling factors.. but the principle is something similar to the Super-sampling but with the addition of the gaussian filter. to answer your question about 2x DSR with 33% smoothing looking better, just depending on what kind anti aliasing method.. better than traditional MSAA and SSAA? nope hell no, but it can be less taxing, personally I think that the "smoothness" it's just horrible grotesque because it introduce the same effects of FXAA, TXAA, TAA and similar shader based anti-aliasing.. the effect of this also vary from person to person and the kind of panel utiized, some monitors have better sharpening than others in regard to image quality, so this affect entirely the end result of DSR+Smoothness percentage. For example I find quite acceptable from 1920x1080 DSR'd up to 2560x1440+10% smoothness, depending on the same it's less demanding than other traditional AA settings, but im fan of ultra sharp games so not everyone will think like me, I always use sharpening filters like SweetFX just to mention one.. best would be just to test yourself by a per game basis because every game behave different. For me, I'm at 1080p and only use 4x DSR with 0% smoothing. Works great for older games like Left 4 Dead 2 etc. Otherwise, I tend to stick with 4x/8x MSAA + FXAA. On the other hand, the scaling used in say, dsfix for Dark Souls is excellent at 1440p for 1080p. It's kind of a crap-shoot. and voilá.. everything should be windowed + 4K. I would not try anyway Skyrim at 4K with a GTX 960.. probably 2560x1440 if you run it without mods. Only real mods I use are QoL stuff and Skyrim HD. I'll try that ini fix, thanks. I only ever use 2x/2x (4K) DSR @ 0% blur. Everything else actually looks worse than native resolution. VSR looks so much better. Also, keep in mind that DSR used to correspond to your monitor's resolution (IE, 1920x1200 = 3840x2400), but now acts as a base of 1920x1080 (so 3840x2160), so you're still not getting a perfect 4x for your display. Don't think that's true. DSR 4x on a 1440p screen enables 5120x2880. I don't currently have an Nvidia GPU, so I can't test. But through numerous drivers it was a constant complaint on the GeForce drivers forums. If they fixed it, that's good to know. Anyone know how to run DSR 8x? 4x DSR has always been 5120x2880 on my 1440p display since it was first released in the drivers. It's easy to just use the 2x, 3x, and 4x solutions, just get rid of everything else. This way you can quickly determine if you have enough horsepower to run at those resolutions, and the significant jump in pixel processing count should yield a dramatically more noticeable improvement. However, I used to run Witcher3 at 2.5x because it was just the 'Sweet Spot' for perfect framerate and IQ i could balance for the resolution I Was running on my fw-900 so once you're comfortable feel free to dial it in more. You need to adjust the smoothness in a per game basis. Some game engines are significantly more jaggy than others, and while one game might be perfect at 33% to get rid of AA, others may not need any, giving you better texture pop. 2x and 3x is still non-integer pixel scaling to your native resolution. The idea of doing 4x is it is perfect integer scaling that requires no smoothing. While 4x is ideal, I don't think 2x with 12% smoothing is that bad, in situations I need to use 2x scaling I been using freestyle to sharpen it up post process at +5% sharpening/+5% clarity, makes it more tolerable. I can't run every game at 6880x2880. He is using CRT so "native screen" resolution doesn't apply exactly the same way the rest of US.. his experience will be entirely different and probably will never require the usage of smoothness. Ja, I missed where he said FW900.